Playing the blues is more about feeling than the technical knowledge you have of the form. It helps to know that a blues scale is a major scale with a flatted third, flatted fifth, and flatted seventh, (or a minor pentatonic with a diminished 5th), but this is only theory and means nothing if you can’t apply it with that magic ingredient, emotion. There are a lot great blues guitar players who don’t know how to read music or how to construct scales and chords, but they have emotion. When the blues were born in the deep south, most of those players didn’t have a clue about the theory behind what they were playing, but they understood the emotion behind what they played. While it isn’t necessary to take blues guitar lessons on a regular basis, it never hurts to take at least one blues guitar lesson just to get you grounded in the genre. There are several types of blues guitar lessons you can take, depending on the goals you want to accomplish. There are lessons for ear training, lessons for sight reading, lessons about technique, and lessons that teach you the structure of the blues. Studying any of these elements can certainly be beneficial, but the one thing you can never do enough, not only when you’re studying the blues, but for any other genre, is to practice. Start with a simple blues guitar lesson—a scale, for example—and practice that lesson until you know it without thinking about it. 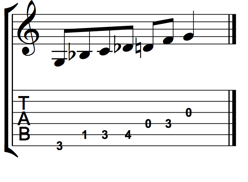 Here’s a blues scale in G. The example shows the notes of the scale in traditional notation and guitar tablature. Play this blues scale pattern until you can play it effortlessly, without thinking about it. The goal is to teach your fingers the pattern so you can play it ascending (going up) and descending (going down). Don’t worry about speed. If you listen to a lot of blues, you’ll see that speed isn’t an element necessary to playing the blues. Mastering the notes and playing them with emotion is the goal for blues playing. Once you’ve gotten a handle on playing the notes of this scale in consecutive order, up and down, work on moving the same pattern up the neck of the guitar, beginning the net position on the last note of the previous position. This pattern, like all scale patterns, can be played in any key, depending upon the starting (root) note. Once you’re familiar with the scale in a few positions, start using it to make music. Scales alone are not going to teach you to play the blues. These are the notes you’ll be using, but not necessarily in the order they appear in the scale. Play the notes randomly, using a backing track of the 12-bar blues to solo against. Choose the notes from different scale positions on the guitar to give variety to the licks you’re playing. This is where the feel of the music comes in. There are a couple of playing techniques you can use to give your blues licks and solos that “sound.” Bending notes and adding some vibrato are key elements to playing the blues. Slow bends on the “blue notes” and vibrato work well. It’s hard to tell someone what to “feel” when they play blues guitar, but when you hit on that magic combination of tone and technique, you’ll know it. It is not clear to me how to move this blues scale in G up the neck. you beginning the “net position” ( I assume you mean next) on the last note of the previous position, which would be the open G – but then the pattern does not seem to fit.